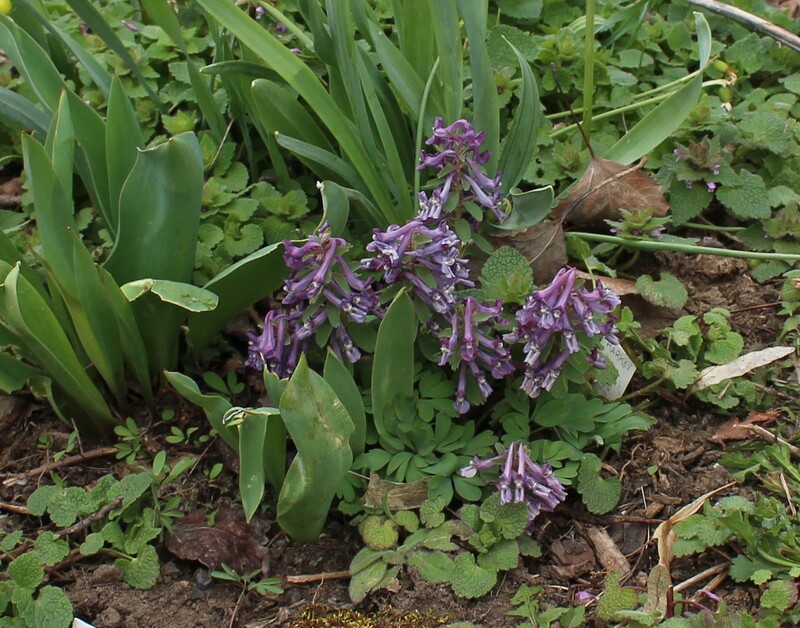 This entry was posted in early spring, spring bulbs, Uncategorized and tagged bulbs, corydalis, flowers, garden, spring flowers. Love them here too. Discovered on Van E.’s site and not knowing much, threw the solidas in the soil. They seed around and I’m getting many little plants all over the yard. Purple Bird, Geo. Baker, a white one from Russell @ Odyssey, and a pale lavender one hitch hiking in on a plant from a friend. I have more on order from Odyssey for this fall. What I love about his site is the cultural instructions, and the recommended for our region is the modified continental. Our friend John L. grows many more types in his excellent garden conditions – they were beautiful weren’t they! Odyssey’s site is very helpful, it’s a great mix of excitement for every new thing, plus realistic growing advice for bringing it to your own garden. I wish I knew why several of mine didn’t make it, but I suspect it’s something in the particular spot I put them. I’ll just have to try again! Too bad I can’t make another trip to John’s. I saw a few pictures and wow, the corydalis were barely starting when we were there last and have just about exploded in the weeks since! We’ve been enjoying Corydalis solida for a few years now and are getting various coloured seedlings. I haven’t noticed any seedlings from Beth Evans, just from C. solida. They are beautiful plants and I hope to add more in the future. I bet they love your woodland garden! I think you should definitely have more! I didn’t realise there were so many different cultivars… must have a look around for some others here too. Not a plant for my garden here, but I enjoyed reading your enthusiastic account of them. Thanks Christina, I will have to remind myself of that the next time I covet your anemones! We are supposed to have a cold blast next week and I suspect all the flower buds on my wisteria will be lost for the season. Italy is sounding better and better. Thanks for the information and encouragement to add corydalis. Will have to get on the bandwagon. 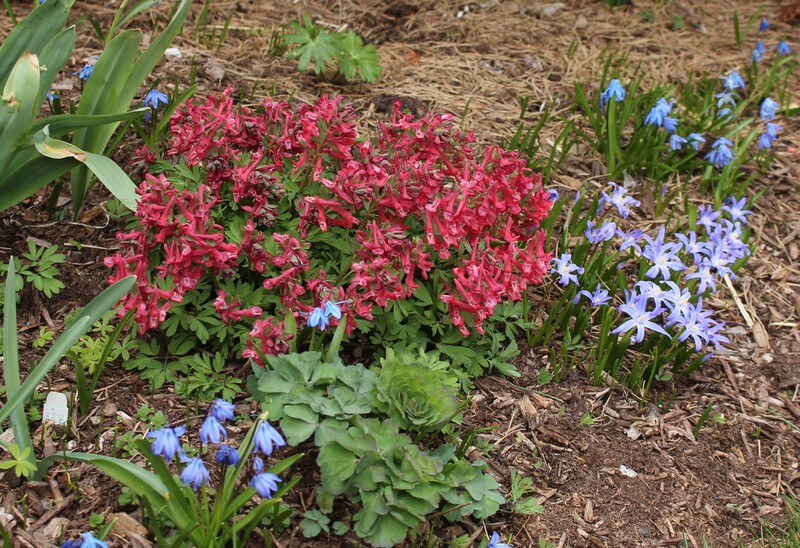 Corydalis ‘Rosula’ is a lovely color. Thanks Susie, it seems like there are always so many new things worth trying there’s never enough time or room! I love them, why doesn’ t everybody grow them? Such little gems and they seed around so generously. You have a lovely collection. Have you got the lovely white one; Corydalis malkensis? If not, you really need it. I was quite relieved, reading through your post. I’ve tried once, ‘George Baker’. It died. Your experience suggests that I should persevere. I think they’re worth a second and third try. If you haven’t seen Cathy’s links you may want to take a look, there are other species as well and a few of them might be even more tempting! I am addicted to Ian’s bulb log. It’s excellent reading with a martini. I ordered a bunch of Erythroniums and Fritillarias from Russell last year but they are not up yet. 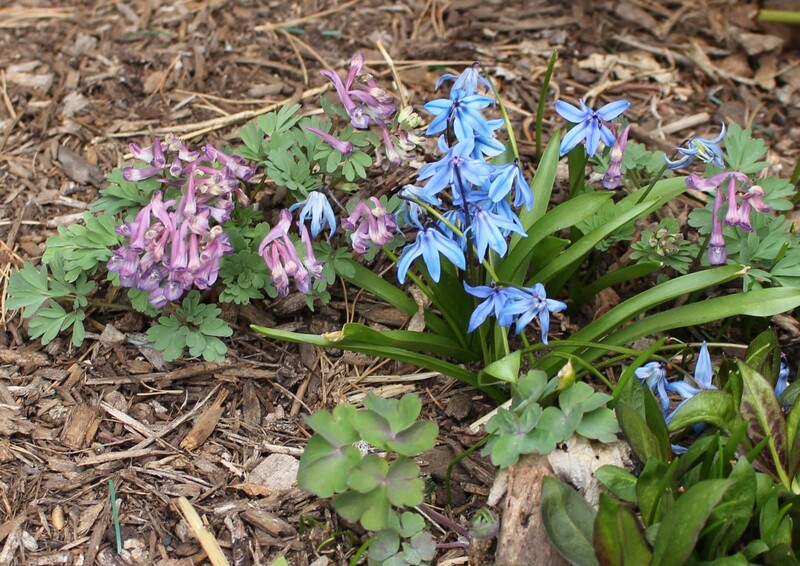 Nevertheless I just ordered more bulbs from him inc. blue corydalis that does not go dormant. Isn’t this fun, more obsessions! I spend hours browsing the bulb log in January, I need that reminder that there’s a light at the end of the tunnel and winter will end! I’m looking forward to seeing how your new bulbs do this spring. The down side to these little guys is it takes a few seasons before they show off… not quite the same as spending 5$ on a bag of trumpet daffodils! Your post inspired me to try some. For some reason, I was left with the idea that they were difficult and that we were too cold for them. 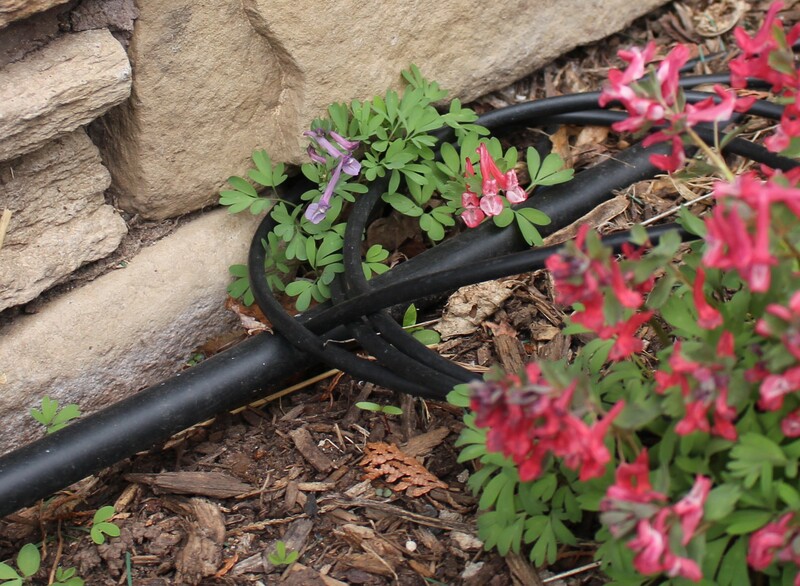 I had to change my mind last year when I noticed, in an abandoned garden, that some variety of corydalis had taken over a whole backyard. I think there are plenty of difficult types, but there are also plenty of pleasant weeds! Some might not be hardy for you, but I bet it’s worth experimenting if you can find a few of the more readily available types… although for me it was almost a struggle to get the cheapest of them, the straight Corydalis solida, to settle down into the garden. I didn’t know you had voles…. I think they might be the number one garden pest which I would hate to have. My losses were very hit or miss, and I doubt something dug up and stole the tubers, but you never know since sometimes they seem to know exactly which are most valuable or your newest favorites! 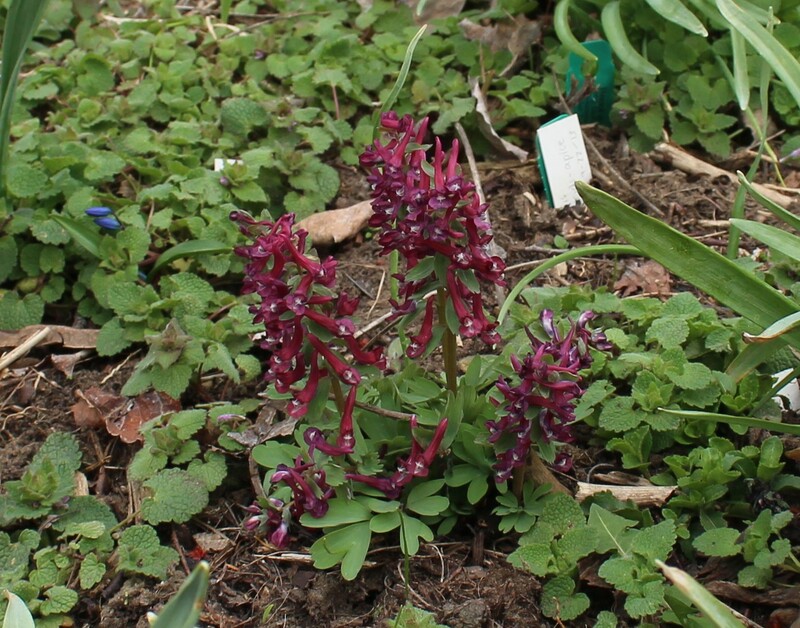 I love this corydalis and you just get more and more of it the longer you have it—a prolific self seeder. You don’t really need to keep buying different colors. They hybridize quite readily in the garden and you will get every color of the rainbow. Just put the ones you have near each other. 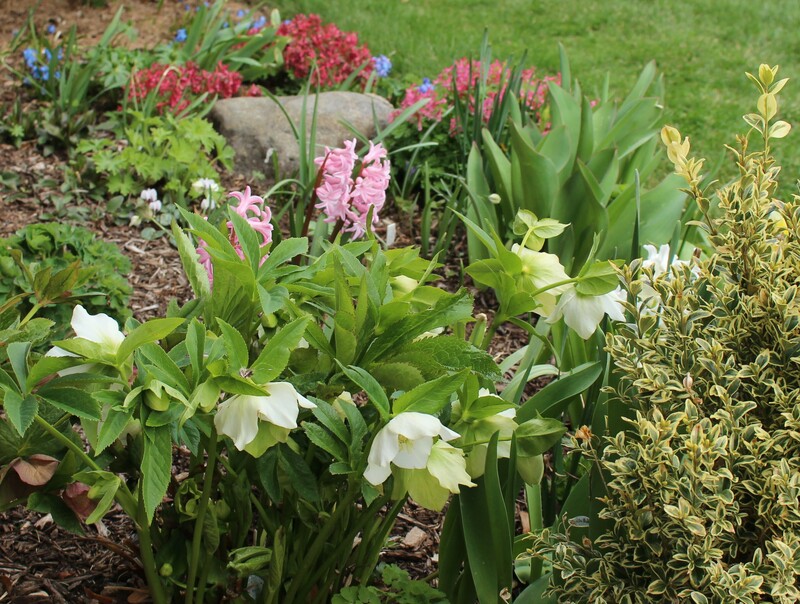 I noticed are up and flowering….and not fazed by the snow. They grow at the base of my 100 foot ash trees. I should add them to some other shade spots…thanks for inspiring me to plant more.